So I picked up my artwork from B-Square Gallery. (click for previous post about my debut as an exhibiting artist) Unfortunately, neither piece sold, but it was a wonderful experience being in a group show. Best of all, it has lead to another group exhibit. 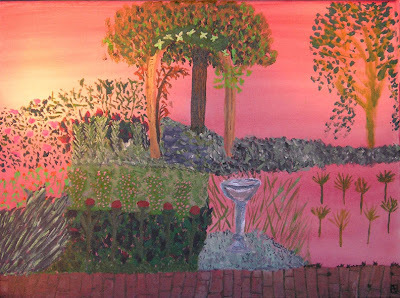 The Friends of the Haverford Library are presenting an Art Exhibit and Sale entitled "Art of the Garden" April 8 - June 21, 2011. I'm working on a Mixed Media Garden Series (click to view a sampling of the series) and was hoping to have more than one piece in the exhibit, but they only chose Fuchsia Garden. That's alright, it's all fun and exposure and means I get to enjoy another wine & cheese reception. Below is the press release. Come out and support the event if you can.